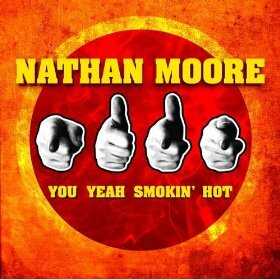 Unlike the raw, folk music I heard during Nathan Moore's thought provoking solo sets on a recent short tour of the Northeast, his latest release, 'You Yeah Smokin' Hot', takes advantage of what the studio has to offer today's musician. With a full band, backup vocals, overdubs, sound effects and the occasional spoken recording, 'You Yeah Smokin' Hot' is a stark contrast to what you may have seen lately from this poet. But what it does share with Nathan's live performance and his folk roots is the ability to plant single lines of quotable text in your head. Prophetic sayings. He may be talking about a lighthearted episode of love or describing life in a small town, unlike anything that you have ever experienced, but regardless of your background, his words make you sit up and take notice. He is speaking about your thoughts. He is speaking about the fears that haunt you. And in doing this he is paralleling what all good folk singers have done throughout musical history. His words comfortably confirm that you are not alone. As of late, Nathan has not spent too much time touring with one project, changing the line up backing him and the music he is playing as often as he changes clothes. The arrangement of the various fashions of the songs on the album mirrors this road blueprint, never getting into a rut of monogamy, choosing to keep the listener from growing content. Thus, 'Yeah You Smokin' Hot' forgoes any singular niche to describe what is heard. So whether you've seen him as a member of The Muse'ment, with Surprise Me Mr. Davis, performing solo, or any other way, you can be sure that there is something on this album influenced by your favorite of these stops on Nathan's latest journeys. 'Gotta Make It', the albums opening tune, gives a glimpse into Nathan's country roots. He is a product of Appalachia and it goes without saying that Willie, Johhny and Kris could be heard on the turntable in Nathan's childhood home. And they can be heard here in Moore's storytelling and dark chords. The choruses of the song are juxtaposed to the verses and take you to the streets of New Orleans with the addition of an accordion, zydeco style. 'Lost and Found', a song about the realization that you can't escape yourself no matter how much you ingest, comes from the country side of the tracks as well, but it has a much more driving sound- rhythm with a simple drum line accented by tambourine and a walking bass line, banjo picking and an omnipresent electric guitar playing single notes that rise and fall like a dark road through the hills. If the country heredity isn't in your genes, don't fret. Many other styles are prevalent on this album. Perhaps mod-rock-a-la-1967-London is more your bag, baby. Nathan penned a masterpiece channeling this time period in his new-love inspired 'She Made Me Love'. Or perhaps you are an alt-country/ vampirism blues fan. I mean, who isn't? Nathan can quench your thirst as well with his answer to Queen and 'The Rocky Horror Picture Show' with his original 'Gotta Be'- a show tune with dichotomy existing between the slow verses and the anxious choruses. Still not satisfied? 70's doo-wop? 'Daydreamin'. A slice of life story ripped from the journal of David Bowie's journal with a keyboard part that defines the song as grounded in white man's R&B? '82nd Avenue'. Or maybe you just want a chuckle as if you were listening an old Monty Python recording? Well, look no further than 'Every Silver Lining'- an ironic way of looking at a common expounding of hope turned upside down to be a proclamation of sorrow. But the pièce de résistance of this album comes in the form on its unassuming sixth track, a song that cannot be packaged as Nathan's take on anyone else's style. 'Tell Me More' seems an incredibly apropos title for this song- because that is exactly what he does within this dreamy lullaby. He draws the listener in with slow, repetitious piano trills until you are entirely hypnotized, leaving all other sounds, thoughts and images behind. Your mind becomes connected with this powerful ode and then he tells you Moore. "Somethin' bout the way you sort of smile and cry at the same time just gets me high" hits home with me as if he was sitting in my brain looking at my wife as he wrote this song. The mind-meld was complete and this powerful poetry spoke to me directly. When Zach Braff directs his next movie, look for this song in the scene when the hero realizes that he is in love with the girl from his past. No song would be more fitting. My first exposure to the music of Nathan Moore will not be my last. 'Yeah You Smokin Hot' is a buffet if all the different entrees in which Nathan specializes and, like me, you will continue to fill your plate with what he's offering. Bon appétit!